You may have heard that late in 2016 NPORS changed the way they offer their operator cards in order to bring them more in line with the cards offered by CPCS. 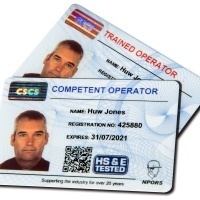 They now offer two options – a CSCS NPORS operator card and a traditional NPORS operator card. The New CSCS Card- Much like the CPCS operator cards this type of card will require you to successfully complete practical and theory tests after which you will be awarded a two year ‘red’ operator card. During the two years you must then register and complete an appropriate S/NVQ to be awarded a ‘blue’ Competent Operator Card which will then be valid for 5 years. Unlike CPCS, you have the option of undertaking the practical and theory tests either at an accredited test centre or at another location of your choosing (assuming it meets the necessary criteria). Before undertaking any CSCS NPORS practical or theory test you will need to have passed a Health & Safety touch screen test within the two years prior. If you currently have a valid ‘traditional’ NPORS card there is the option of changing it to a CSCS card by passing a Health & Safety touch screen test and applying to change the card. For more information about NPORS and their card scheme please see our NPORS page, visit their website www.npors.com or contact us in the office for a chat.